On this day in history, August 4, 1780, Bird's Expedition against Kentucky comes to a close. A series of British expeditions to capture the American frontier was launched in 1780. The goals included the capturing of St. Louis and New Orleans, Louisville and Vincennes. Most of these ventures failed, but the most successful was a campaign into Kentucky led by Captain Henry Bird from Fort Detroit. Bird's objective was to capture Fort Nelson at the falls of the Ohio River, the present day site of Louisville, Kentucky, which was then the main base of American general, George Rogers Clark. Bird left Detroit with 150 men in June and met with Indian allies to discuss plans for the upcoming raid. Bird ran into trouble when the Indians were hesitant to attack Fort Nelson. 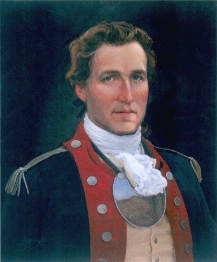 General Clark, or the "Chief of the Big Knives," as the Indians called him, struck terror in the hearts of the Indians for his many raids and victories in the recent past. Instead of attacking Clark's base, they insisted on attacking less significant posts in eastern Kentucky. Settlers were filling Kentucky and were protected by small posts or forts located every few miles. The Indians wished to attack these lightly guarded posts and capture prisoners and booty. The prisoners could be exchanged for money at Detroit, taken into slavery or adopted into the tribes. Indian wars during the 1780s and 90s. the Battle of the Wabash in 1791. 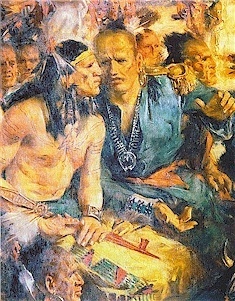 Bird argued with the Indians for days, but finally was forced to give in to attacking the smaller outposts on the Licking River. A large force of a thousand men, mostly Indians, arrived at Ruddell's Station early on June 24th. Ruddell's Station was a stockaded log fort with about 20 families inside. Approximately 350 people lived in the vicinity. The fort was surprised and a gun battle began. When a British cannon shot a hole through the wall, the fort quickly surrendered. Unfortunately, the Indians violated the peaceful surrender terms and rushed in, took prisoners and killed several people. The settlers were stripped naked and all their goods plundered. To Captain Bird's horror, the Indians killed all the settlement's cattle, which he intended to keep for food. On the 26th, Bird and the Indians approached the nearby Fort Martin. This fort quickly surrendered, but again, the Indians violated the prisoners, killing some and taking the rest prisoner. Captain Bird was exasperated by this time. He had no food to feed hundreds of prisoners and the Indians could barely be controlled. They still refused to attack Fort Nelson and wanted to perform more raids on small settlements for booty and prisoners. In addition, it was rumored that General Clark was amassing a force to retaliate against Bird's Expedition. Bird finally convinced the Indians to call the expedition off. During the march back to Detroit, some prisoners were killed if they straggled. All were nearly starving and they were forced to march quickly because General Clark was now coming in pursuit. Bird finally reached Detroit on August 4, exhausted and nearly starved. Of the hundreds of prisoners that survived, some joined the British army, while others settled in Detroit. Some were forced into slavery or adopted into Indian tribes. All those who remained in British custody until the end of the war were finally returned to Kentucky when the war ended and the state of Virginia paid to help bring them back to Kentucky.